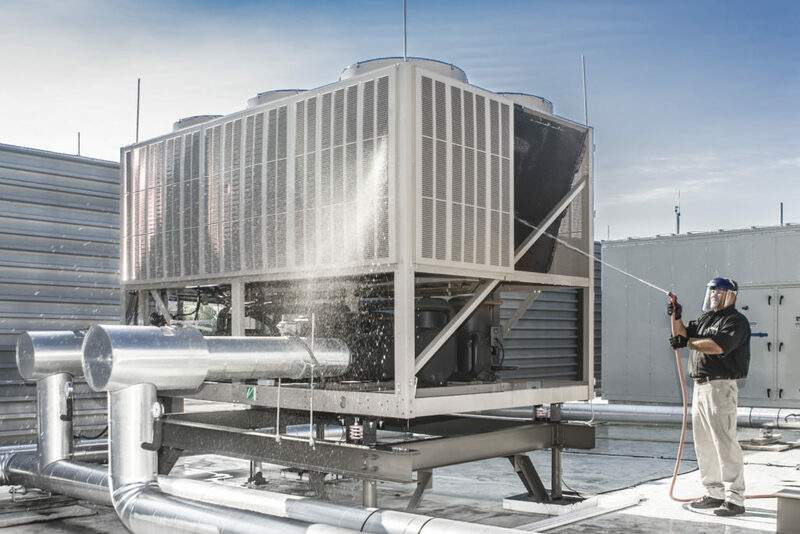 Keep building occupants safe and your water-cooled HVAC system performing reliably and efficiently with cooling tower maintenance from Pur-Vent. Once a month, water in your cooling tower should be treated with biocides and a corrosion inhibitor. This is a preventative treatment that will keep bacteria levels low to minimize the risk of outbreaks that could affect air quality. If we detect high bacteria levels during routine maintenance, we’ll disinfect it to bring levels down to an acceptable level. Periodic water testing is another step that can be taken to reduce your risk of an outbreak. We’ll take the time to explain test results and make recommendations on how to correct any abnormalities. With a cooling tower inspection as part of your preventative maintenance plan, we’ll check for the presence of bacteria. Our inspection includes checking drains, basins, and nozzles for corrosion and scale build-up. With seasonal cooling towers, we’ll do a deep cleaning of all interior surfaces. This process should be done twice a year for towers that work year-round. Our meticulous approach to preventative cooling tower maintenance also include system maintenance. This process involves cleaning and adjusting electrical and all mechanical components. If you need HVAC Cleaning and Restoration services then Contact Us Today! You can Also Reach us on Facebook.